One of the most enduring "Holy Grail" experiments in science has been attempts to directly observe atomic motions during structural changes. This prospect underpins the entire field of chemistry because a chemical process occurs during a transition state—the point of no return separating the reactant configuration from the product configuration. What does that transition state look like and, given the enormous number of different possible nuclear configurations, how does a system even find a way to make it happen? Now in the journal Applied Physics Letters, researchers at the Max Planck Institute for the Structure and Dynamics of Matter are reporting "ultrabright" electron sources with sufficient brightness to literally light up atomic motions in real time—at a time scale of 100 femtoseconds, making these sources particularly relevant to chemistry because atomic motions occur in that window of time. After seeing the first atomic movies of phase transitions in bulk thin films using high-energy (100 kilovolt) electron bunches, the researchers wondered if they could achieve atomic resolution of surface reactions—occurring within the first few monolayers of materials—to gain a better understanding of surface catalysis. 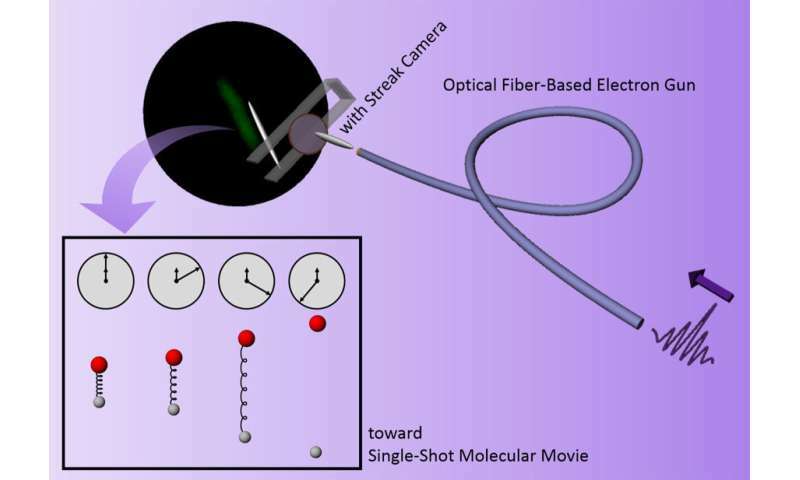 So they devised a low-energy (1-2 kilovolt) time-resolved electron diffraction concept of using fiber optics for miniaturization and the ability to stretch the electron pulse, then apply streak camera technology to potentially obtain subpicosecond temporal resolution—a difficult feat within the low-electron energy regime. "The first atomic movies use a stroboscopic approach akin to an old 8-millimeter camera, frame by frame, in which a laser excitation pulse triggers the structure, then an electron pulse is used to light up the atomic positions," said co-author Dwayne Miller. "We believed that a streak camera could get a whole movie in one shot within the window defined by the deliberately stretched electron pulse. It solves the problem of low electron numbers and greatly improves image quality." Of the myriad possible nuclear configurations, the group discovered that the system collapses to just a few key modes that direct chemistry and that a reduction in dimensionality that occurs in the transition state or barrier-crossing region can be inferred. "We see it directly with the first atomic movies of ring closing, electron transfer and bond breaking," said Miller. Fantastic - now if they can move from concept to a working camera and movies on the scale proposed. Sounds like an excellent scientific tool.